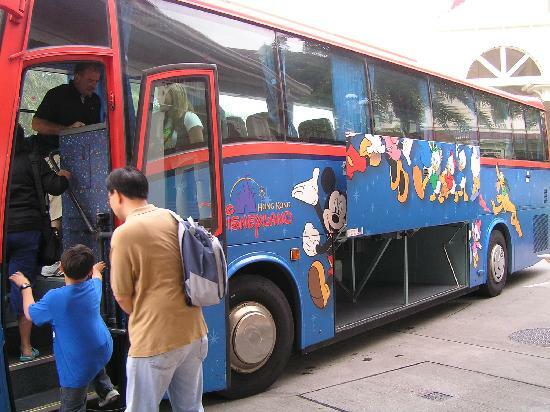 There are six local bus routes operated daily by Long Win Bus and Citybus to and from Hong Kong Disneyland. The cross-boundary bus route is also operated daily between Mainland China and Hong Kong Disneyland. Routes R11, R22, R33 and R42 operated daily to and from Hong Kong Disneyland. Operating Hours 15 – 45 minutes after the fireworks display finishes in the eveing. 20 minutes after the fireworks display. Guests may also take any "A" or "E" bus routes to Lantau Link Toll Plaza and interchange with Route number R8, which runs regularly during the day to Hong Kong Disneyland. Guests can get to Lantau Link Toll Plaza by taking one of the following "A" or "E" routes operated by Citybus and Long Win Bus. A discount of HK$1 to HK$7 is offered on the second leg of the journey for passengers using Octopus card. * Due to a special event, bus route R8 will not enter the Inspiration Lake Recreation Center from 9:00am - 11:00am on October 23 and from 9:00am - 10:00am on November 6, 2011. The cross-boundary bus route provides transport services between Hong Kong Disneyland and Mainland China via Huanggang. Note: The above information is for reference only, and is subject to change without prior notice.